Post-examination should reveal the local cathode, since it will remain impervious to the corrosion attack. Pitting corrosion is a localized form of corrosion by which cavities or "holes" are produced in the material. Pitting is considered to be more dangerous than uniform corrosion damage because it is more difficult to detect, predict and design against. Corrosion products often cover the pits. A small, narrow pit with minimal overall metal loss can lead to the failure of an entire engineering system. Pitting corrosion, which, for example, is almost a common denominator of all types of localized corrosion attack, may assume different shapes. c. The presence of non-uniformities in the metal structure of the component, e.g. nonmetallic inclusions. 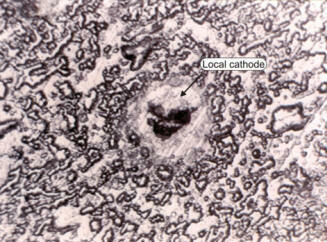 Theoretically, a local cell that leads to the initiation of a pit can be caused by an abnormal anodic site surrounded by normal surface which acts as a cathode, or by the presence of an abnormal cathodic site surrounded by a normal surface in which a pit will have disappeared due to corrosion. In the second case, post-examination should reveal the local cathode, since it will remain impervious to the corrosion attack as in the picture of an aluminum specimen shown on the right. Most cases of pitting are believed to be caused by local cathodic sites in an otherwise normal surface. Apart from the localized loss of thickness, corrosion pits can also be harmful by acting as stress risers. Fatigue and stress corrosion cracking may initiate at the base of corrosion pits. One pit in a large system can be enough to produce the catastrophic failure of that system. An extreme example of such catastrophic failure happened recently in Mexico, where a single pit in a gasoline line running over a sewer line was enough to create great havoc to a city, killing 215 people in Guadalajara. Pitting resistance equivalent number (PREN): an empirical relationship to predict the pitting resistance of austenitic and duplex stainless steels. It is expressed as PREN = Cr + 3.3 (Mo + 0.5 W) + 16N.